Yay! Work is over, summer holidays are here and I’ve finally had a chance to get some blog posts going again! So what’s kept me so busy? All that end of year socialising! Actually getting outside and away from the computer and hanging out with friends! 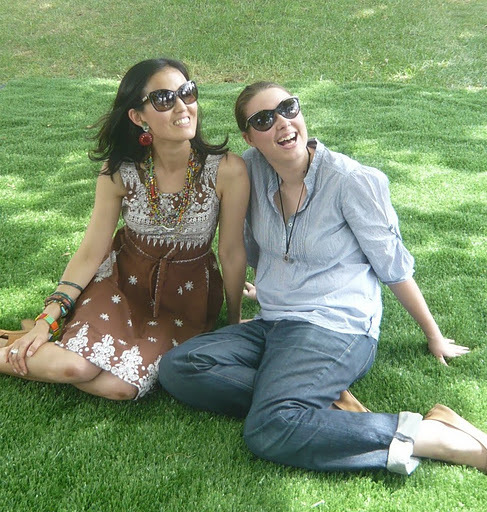 I even managed to find time to sit around on some lawn in the sun during a lunch break lately thanks to a campaign from OPSM … if you’re in Australia you’ve still got time to check it out and maybe become the face of OPSM! At the very least, you’ll get free ice-cream and a photo of yourself in some cool new shades, so what is there to lose? Here’s a shot of me looking a bit more normal. 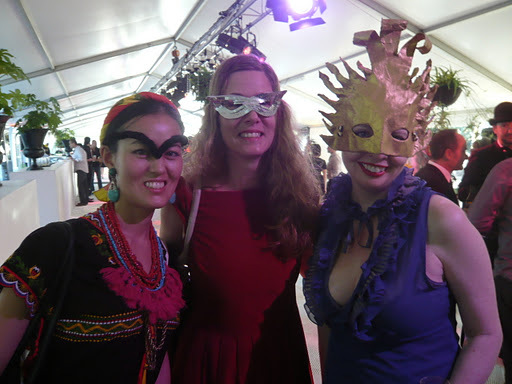 The party was held in a marquee in the beautiful Carlton Gardens. 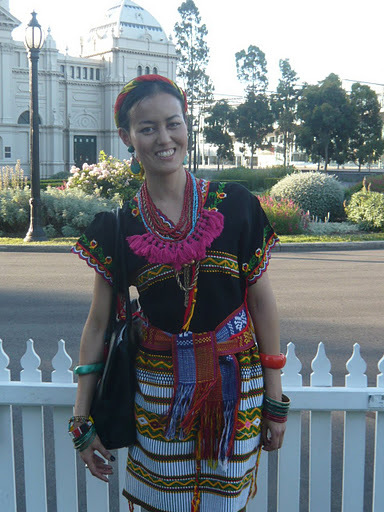 I’m wearing a dress I’ve posted about before, probably from south-east Asia, but I obviously looked quite authentically Frida-ish because a guy from Central America came up to ask if the dress was from somewhere in South America! And on the way home, an old guy started smiling as I was walking in his direction and said “so colourful!” as I went past. Even if you’re normally someone who only wears black, I recommend trying some colour out this summer. I can practically guarantee it will lift your mood, and those of everyone around you! I can also recommend having a picnic in an unlikely place, such as a median strip. 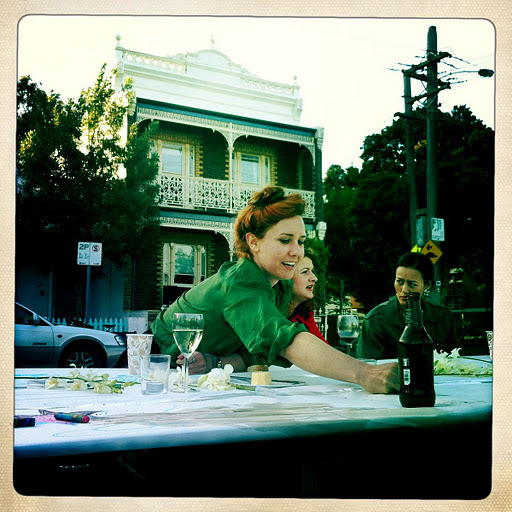 The ever enterprising Tullia Jack invited a big group of friends around to dinner at her house last week, but as it was such a lovely evening, we ate at tables made from planks and milk crates, garnished with orchids, all set up on the median strip. How much more Melbourne could you get?! Despite the uniqueness of the evening, I stupidly didn’t take photos, so this one (with Tullia, Berri and myself) is from one of Tullia’s friends! Continuing the “I didn’t take photos” theme, I went to a lovely picnic at the Royal Botanical Gardens on the weekend and got NO photos of us all lazing around eating strawberries, cheese, olive bread and copious amounts of dip. 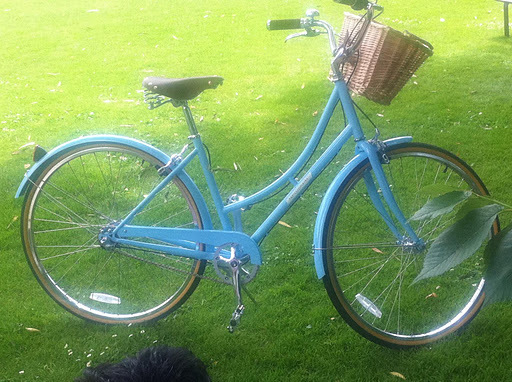 But someone did take a picture of the bike (Papillionaire) which the lucky Fabia was given by her boyfriend! I did remember to get some shots as we were leaving the gardens, which are looking simply SPLENDID this year after all the rain we’ve had. 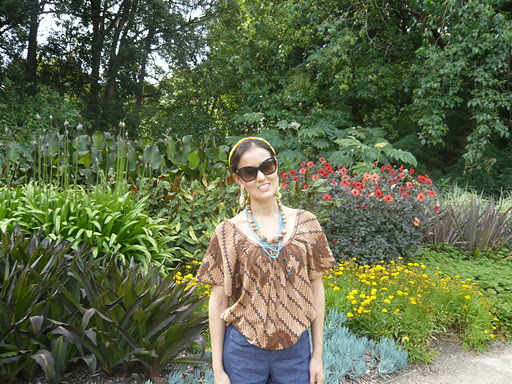 I’m in my new Dolce & Gabbana catseye sunnies from OPSM, but everything else is stuff I’ve had for ages (top made from op shop batik material that cost about $1, shorts from Camberwell market for $5, headscarf $2 from Savers and jewellery from all over the place as usual). Glowstick? Check. Messy ice-cream? Check. Christmas T-shirt? Check. And T-shirt wound around head to keep out noise of carols? Yes, Eddie has that too. 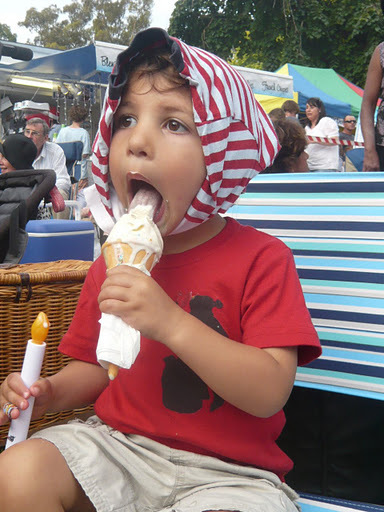 I enjoyed watching him attacking that ice-cream much more than I enjoyed the carols!! 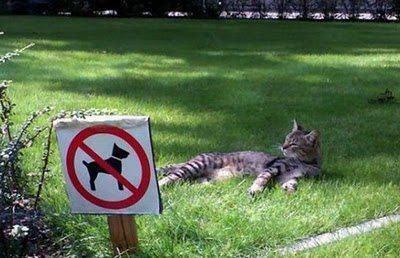 How cool is that cat!? If you want to be as chilled as he is, you might like to try the Smooth day spa at the Melbourne City Baths, which is what I did last week. Of course I’m not going to put up a photo of myself in a bath, so instead here’s a shot of how the manicure that I had there turned out. 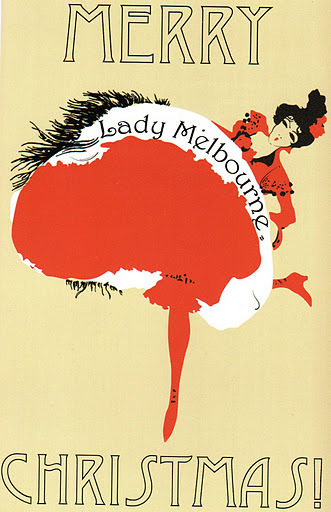 Speaking of doing things differently, how’s this card from Lady Melbourne? I’ve never associated can can girls with the festive season, but hey, why not? There’s still a few days until Christmas, and more to the point, I’m not the Christmassy type (as this article might indicate), but I’d still like to wish you a happy summer/winter/festive season, or whatever it is in your part of the world! What a delight to look through these pictures while we are at 25 F this morning. Happy Holidays to you! How wonderful! It's the perfect time of year to get together with friends for fun and frivolity! :)Enjoy the break.